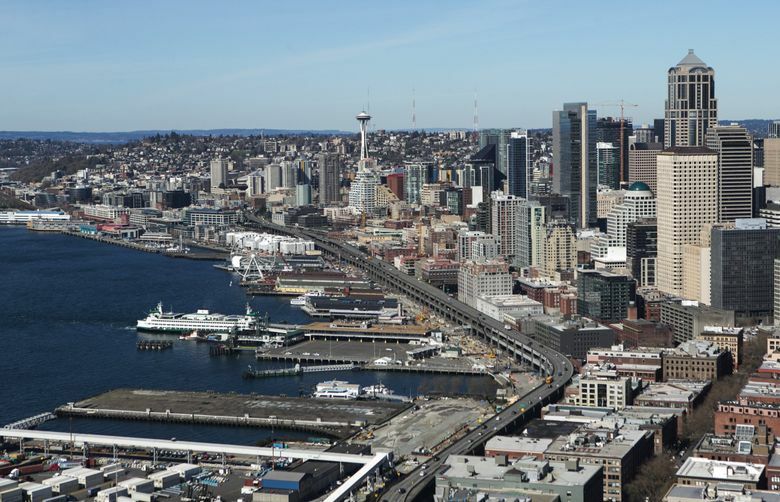 Officials say they’ll soon be ready to schedule a two-week shutdown of the Alaskan Way Viaduct as a precaution while the Highway 99 tunneling machine passes deep beneath the elevated span. Officials still don’t know the exact date when they’ll close Seattle’s Alaskan Way Viaduct to traffic for about two weeks while the boring-machine Bertha passes under it. But that crucial moment in digging the Highway 99 tunnel to replace the aging viaduct is rapidly approaching, David Sowers, a Washington State Department of Transportation (WSDOT) geotechnical engineer, told the Seattle City Council on Monday. Sowers and other officials who briefed the council insisted they’ll be ready and able to manage the precautionary shutdown of the elevated span, which carries an average 60,000 drivers and 30,000 transit users along the downtown waterfront each day. They said the closure will allow them to quickly and easily inspect the viaduct and ensure it remains stable. The surface streets below the span will remain open. During the temporary closure, King County Metro Transit will have to move South Seattle bus routes 113, 121, 122 and 123 and West Seattle routes 21E, 37 southbound, 55, 56, 57, 120, 125 and Rapid Ride C off the viaduct. Through downtown, the South Seattle routes will travel northbound on Fourth Avenue and southbound on Second Avenue. The West Seattle routes will go northbound on Third Avenue and southbound on Second or Third avenues. The Seattle Department of Transportation (SDOT)’s plan for the closure includes introducing signal-timing changes, assigning police officers to direct traffic and boosting water-taxi service from West Seattle, director Scott Kubly said. Some vehicle parking will be removed, and some construction activity halted along congested roadways. SDOT is also working with app-dispatch companies Uber and Lyft, which offer carpooling services that some people might use as alternatives to driving, Kubly said. Officials will ask commuters to consider adjusting their travel times, working from home, or biking or walking to work, as well as carpooling or vanpooling, they said. The closure date is closer now that crews have finished inspecting and replacing cutting tools on Bertha’s face. That task involved diving below ground nearly 100 times to work under hyperbaric pressure in front of the machine. Seattle Tunnel Partners (STP), the project’s contractor, chose to replace only 11 of the more than 700 cutting tools the crews inspected, said Todd Trepanier, WSDOT program administrator. Some routine maintenance must still be completed before Bertha leaves “Safe Haven 3,” the spot underground where crews stopped it last month, Trepanier said. STP has adopted a new monitoring plan after a sinkhole opened up behind the machine. The incident in January led Gov. Jay Inslee to halt the tunneling work for more than a month. Trepanier said officials will provide the public with advance notice once the viaduct shutdown is scheduled. WSDOT has a dedicated website at www.99closure.org.